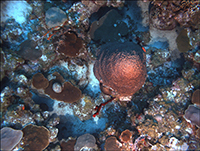 Our interests in large area photomosaicing underwater stem from the limited visibility associated with electromagnetic propagation underwater. We have explored the dominant effects underwater – power, camera-to-light separation, unstructured terrains – and shown the efficacy of our algorithms across a range of geological, archaeological and biological applications from platforms as varied as a nuclear submarine, the DSV Alvin, and the ROV Jason. 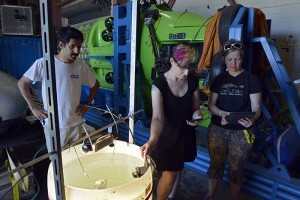 WHOI scientist Hanu Singh watches as Amy Scott Murray (center) from the University of Aberdeen and Erica Fruh, from the Northwest Fisheries Science Center in Seattle photograph a fish in the WHOI high-bay recently. Murray later stitched the series of images into a three-dimensional representation of the fish (see below). Singh, Fruh, and John Galbraith of the Northeast Fisheries Science Center in Woods Hole hope to use Murray’s system to build the next generation of field guide for fish biologists.